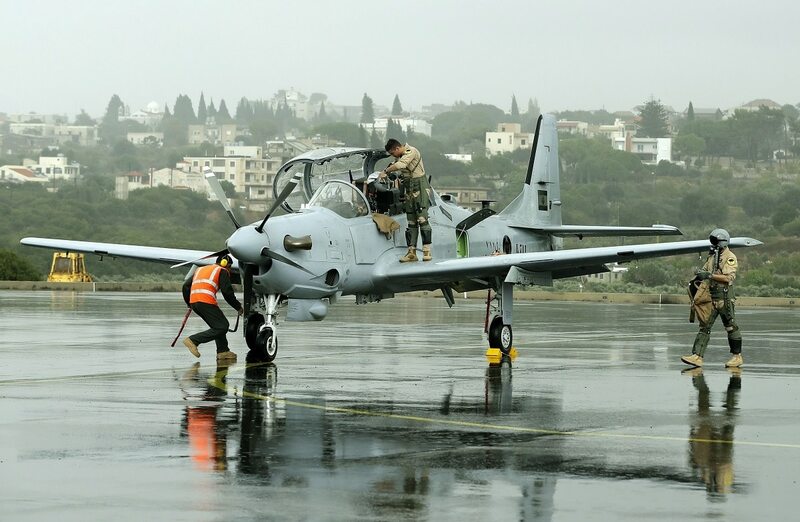 HAMAT AIR BASE, Lebanon ― The Lebanese Army received the first two A-29B Super Tucano light attack aircraft from the U.S. on Oct. 31 during a handover ceremony held at Hamat Air Base, north of the capital Beirut. The two aircraft are the first of six that will be provided by the U.S. to the Lebanese Army within the framework of the military aid program to the country. The remaining four light attack aircraft are expected to arrive before June 2018, according to official Lebanese air ‎force sources who did not want to be named. In all, the aid is worth about $240 million, including basic cost of the aircraft ($204 million), the cost of ammunition and armament ($10 million) and the cost of the training ($12 million). Another source with knowledge of the deal stressed expanded capabilities provided by the A-29 acquisition, considering that the LAF has relied primarily on converted helicopters for military operations. SA 330C Pumas, for example, were used in operations “Dawn of the Outskirts” and “Nahr Al-Bared” to strike militant positions with missiles that were not equipped to be used from helicopter platforms, said the source. Lebanon is also looking to double the LAF capabilities by procuring six additional A-29 aircraft, Commander of the Lebanese Air Force Brig. Gen. P.S.C Ziad ‎Haykal disclosed during the ceremony. The A-29B will be equipped with the 12.7mm (.50-caliber) M3M machine gun, LM 70/7-SF-M9 MK2 multiple launcher (70mm), MK81/82 bombs and GBU-12/GBU-58 laser-guided bombs. The LAF will also likely equip the MK81 bomb with a guidance kit to “make it a smart bomb,” according to a military source. The Advanced Precision Kill Weapon System (APKWS) from BAE Systems is expected to be delivered in May 2018 and supplied on the remaining four aircraft to the LAF, said Haykal. Over the last decade, the U.S. government has invested more than $1.5 billion in training and equipment to support the Lebanese military, and trained over 32,000 troops. The U.S. announced another $120 million in Foreign Military Financing, which brings the total investment in the Lebanese armed forces to over $160 million just this year. To read this story and other defense news from the Middle East in Arabic, visit http://sdarabia.com/.